The Mersey Class Lifeboat "Kingdom OF Fife"
The Mersey Class Lifeboat is designated as a Fast Carriage Lifeboat (FCB), though it is also capable of being launched down a slipway. 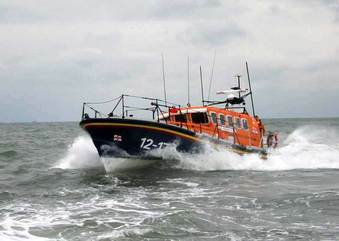 The name "Mersey" was chosen in line with the RNLI policy of using the names of rivers for lifeboat classes. 'Mersey Class' because there are lifeboat stations on the approaches to the River Mersey that operate 'carriage launch' lifeboats and also because the Institute used to operate a 'Liverpool Class' Lifeboat and chose Mersey to reaffirm the links with the area and its great maritime traditions. Construction of the first prototype started at the beginning of 1986 and it was launched in July 1987, serial numbers given to boats refer to the length in meters and the number within its class. Early boats were constructed of aluminium and the later boats including 'The Kingdom of Fife' 12 - 17 are of Fibre Reinforced Composite (FRC). She was launched in 1991.